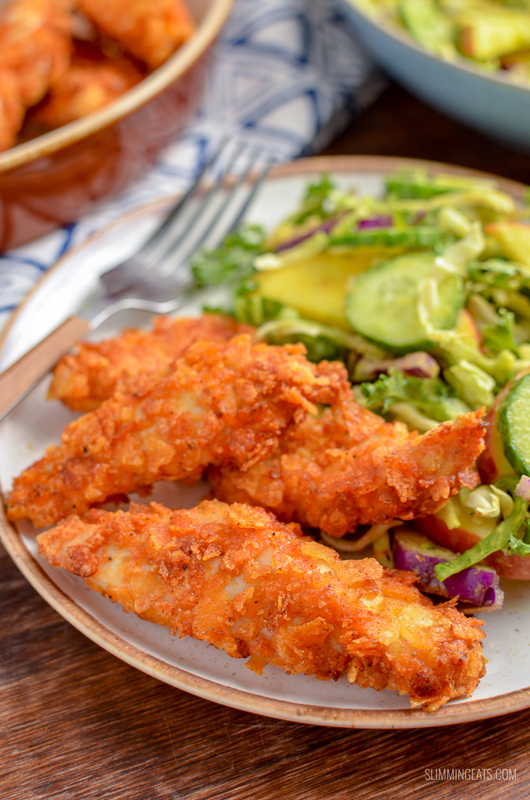 For when you fancy some crispy homemade chicken with minimal effort, this Crispy Air Fryer Potato Chip Chicken ticks every box and the whole family will love it and it’s ready in less than 20 mins. Lunchtime today, I was looking for inspiration of something to make to go with a nice crisp apple slaw salad I had made – shredded kale and broccoli stalks, crisp sweet apple slices and some chopped spring onions. Tossed in a light dressing. It’s my go-to salad at the moment. Usually, I just bake some seasoned chicken thighs or use up any leftovers from the night before, but I really fancied some crispy coated Chicken. With my healthy extra b choice already used at breakfast on some Berries with Ricotta Cheese and a drizzle of honey – delish by the way. I needed something else to coat my chicken and I am not one for tweaks like using smash etc, it just doesn’t do it for me. I’ve been loving my Nuwave Air fryer at the moment. 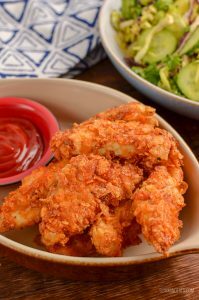 I have an actifry too which I love for cooking chips, but when you want to do something coated like this Crispy Air Fryer Potato Chip Chicken – a basic air fryer with a basket is perfect and this one was a complete bargain too. We purchased it from a shop called Bed Bath and Beyond and had a $20 off coupon when it was already on sale. Which mean it cost us less than $50 at the time. But it is also available on Amazon. 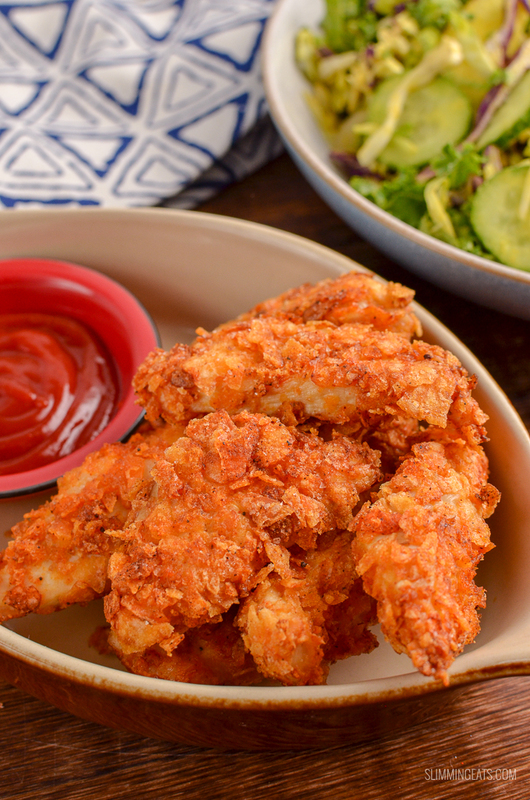 I’m really excited about all the different air fryer recipes I have planned too. Do let me know if you have any special requests. Don’t worry if you don’t own an air fryer, this should cook well in the oven too at 200c/400f on a lined baking tray till crisp and golden. 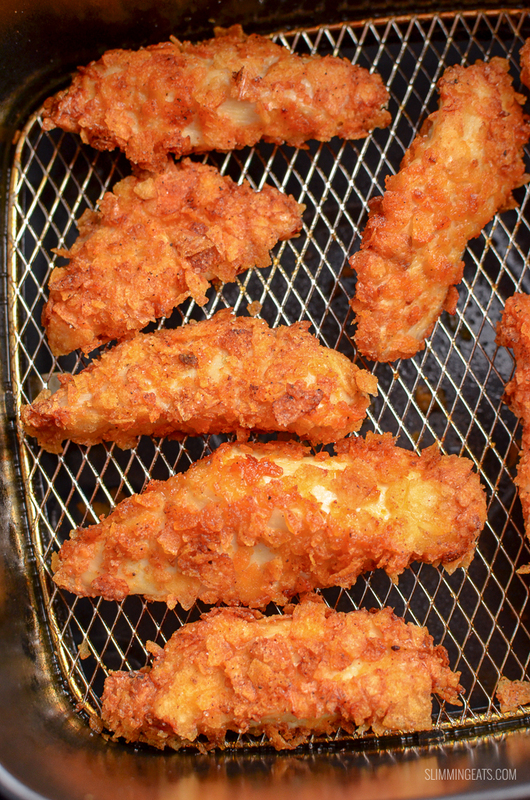 So you can probably guess from the title of this recipe what I used for the coating of this Crispy Air Fryer Potato Chip Chicken. Yep, that’s right a bag of potato chips or crisps as they are called back in the UK. They work perfectly and the kids loved them. A regular 28g bag will make enough for a serving for 2 people, or 1 adult and 2 small kids, so if you want to make more just double or triple up the recipe. 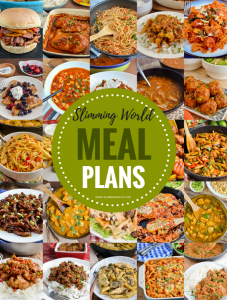 Ensuring you adjust the syns is you use any more than the 14g of crisps per serving. For seasoning, I used some paprika, garlic and onion powder. I didn’t add any salt as obviously ready salted crisps are already pretty salty. So I recommend tasting once cooked and seasoning with salt then if you think it needs it. 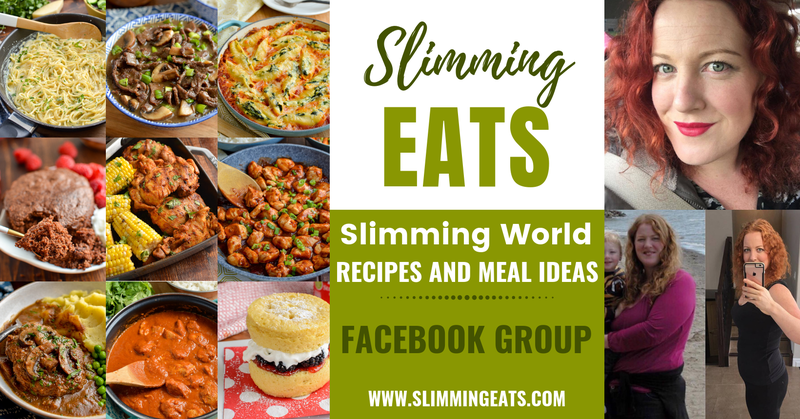 or head on over to my FULL RECIPE INDEX with over 800+ delicious Slimming World Recipes all fully searchable by course, syn value, ingredients etc. This time around for the Crispy Air Fryer Potato Chip Chicken, I just used ready salted crisps (potato chips) but you could actually use flavoured ones too, to add to the flavour of the chicken, cheese and onion, marmite, Worcestershire sauce etc. 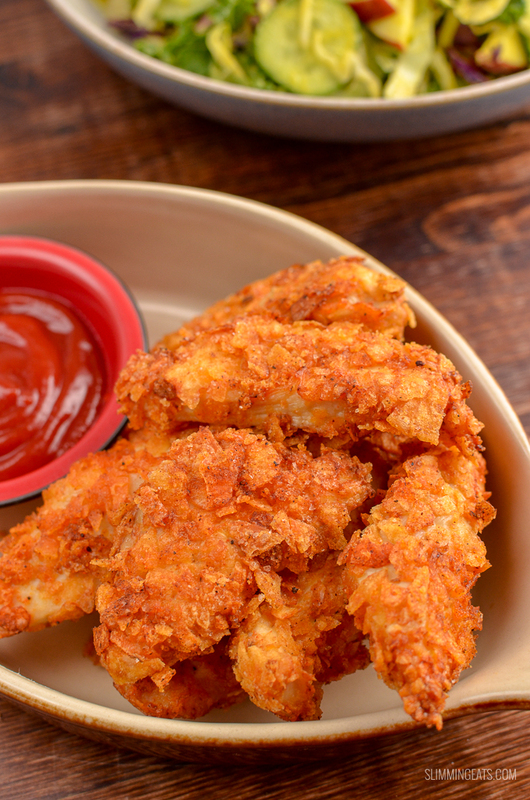 Like spicy chicken? Then just add a little pinch of cayenne, it packs some heat and adds a great spiciness to chicken, fries, rice dishes etc. 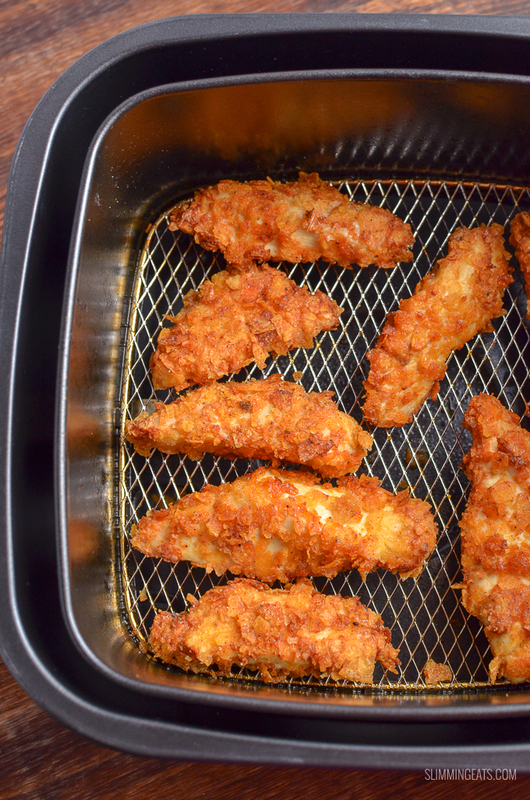 HOW CAN I ADD A 1/3 SPEED FOODS TO THIS CRISPY AIR FRYER POTATO CHIP CHICKEN? Serve with a similar salad to my choosing, or add some other vegetables of your choice and if you can’t do without the side of chips/fries, you could always make some of these Butternut Squash Fries instead. Add the potato chips to a sandwich bag with the paprika, garlic powder and onion powder and bash with a rolling pin till fine crumbs. Add the potato chips to a shallow dish. Using a fork, take a chicken finger and dip in the egg, then roll in the potato chip mixture to coat. and cooked for 8-10 mins, carefully turning over half way through. Different brands of potato chips, can vary in syns, so double check the ones you use. use different flavoured potato chips to add to the flavour. If using an actifry I recommend removing the paddle for these or use one of these mesh trays. If cooking in the oven, place on a baking tray lined with parchment paper and cook at 200c/400f for about 15-20 mins until golden and crisp.